I haven't made any dog biscuits for a while, because we found out one of my dogs (my 13 year-old senior dog) was diabetic. We had a very difficult time getting his glucose regulated. While his sugar was registering so high, I didn't want to give him anything his Vet had not authorized or suggested (even though my dog biscuits have no sugar or salt). Unfortunately, we lost Dexter last week due to the diabetes. He was a big, lovable part of our family since he was 8 weeks old and he is missed terribly. 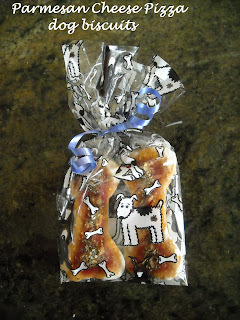 Over the weekend, I decided my two little dogs had gone long enough without their homemade treats. I made some Parmesan Cheese Pizza dog biscuits. I hope your dogs enjoy them as much as mine do. Preheat oven to 350 degrees. Line cookie sheet with parchment paper or light oil. Combine flour, dry milk, garlic powder. Mix in egg. Add water (a little at time) so that mixture forms a ball. Roll out dough 1/4" thick. Cut out with a cookie cutter. Mix tomato paste with water. Add tomato topping and Italian seasoning. Wait patiently while baking 17 to 20 minutes or until golden on bottom. Remove from cookie sheet and cool on rack. Store in an airtight container. You can also freeze them for a longer shelf life. I'm glad I found your blog via the blog hop! !